Have you ever wondered why some nations are rich and others poor? Or, say, why some of the latter can’t get out of poverty regardless of their systems or the number of benevolent outside interventions? Well, Gregory Clark has – and for most of his life. And in “A Farewell to Alms” he offers a rather controversial answer. Who Should Read “A Farewell to Alms”? And Why? “A Farewell to Arms” purports to be a brief economic history of the world. However, you’re in for a big surprise as early as the table of contents where you’ll certainly notice the suspicious absence of any title suggesting a discussion of the ideas of Adam Smith or John Maynard Keynes or of the economic theories of capitalism or socialism. What kind of an economic history is this? – you start to wonder. Because, as far as we know, it’s the only one of its kind. Bear with us to find out which kind. Or read it yourself if you are interested in economics, racial and political history and the nature of social mobility. The best part: even though it features hundreds of graphs and discusses serious problems in economics, no formal economics training is necessary to understand any part of the book. 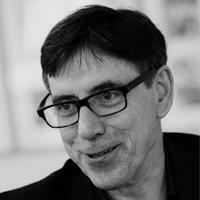 Gregory Clark is an economic historian and a professor of economics at the University of California, Davis. Born in Scotland, Clark attended King’s College, Cambridge before obtaining a Ph.D. degree at Harvard in 1985. Ever since then, he has been researching topics such as social mobility, the wealth of nations, long-term economic growth, and, particularly, the economic history of England and India. The basic outline of world economic history,” writes Gregory Clark at the beginning of “A Farewell to Alms,” “is surprisingly simple. So simple, in fact, that he needs no more than one graph and about 17 pages to recount everything that has ever happened to humans in terms of wealth and incomes – and other related things – from Mesopotamia until today. Before 1800 income per person – the food, clothing, heat, light, and housing available per head – varied across society and epochs. But there was no upward trend. A simple but powerful mechanism explained in this book, the Malthusian Trap, ensured that short-term gains in income through technological advances were inevitably lost through population growth. Thus, the average person in the world of 1800 was no better off than the average person of 100,000 BC. To translate this in no uncertain terms: if you were living in the 18th century, chances are you would have probably lived the way the Nukak people – or, to use an example you can relate to even better, the Bushmen – live today (or, at least, lived up until recently). To you, a fervent reader of Jane Austen novels, this may sound a little bit exaggerated, but statistics demonstratively prove that it is not. Put differently, a typical Englishman had a much worse diet than a hunter-gatherer of the Stone Age, and, since, unlike his distant ancestor, he lived in a society of inequality, he was also far less happy than the latter; both could expect to live no more than, say, 35 years. Jane Austen may have written about refined conversations over tea served in china cups,” wittily remarks Clark. “But for the majority of the English as late as 1813 conditions were no better than for their naked ancestors of the African savannah. The Darcys were few, the poor plentiful. The mechanism which explains why this was so: the Malthusian Trap. #3. Material living standards decline – as the population increases. In a nutshell – the Malthusian Trap is the vicious circle of (anti-)progress! Namely, as Thomas Robert Malthus (after whom the trap is named) demonstrated back in 1798, even if technology manages to increase the material living standards, they, in turn, will diminish the death rate and increase the birth rate, resulting in a society where even though we have more resources to distribute, we need to distribute them among more people as well! The resource supply per capita remains the same! In the Malthusian economy before 1800 economic policy was turned on its head: vice now was virtue then, and virtue vice. Those scourges of failed modern states—war, violence, disorder, harvest failures, collapsed public infrastructures, bad sanitation—were the friends of mankind before 1800. They reduced population pressures and increased material living standards. In contrast policies beloved of the World Bank and the United Nations today—peace, stability, order, public health, transfers to the poor—were the enemies of prosperity. They generated the population growth that impoverished societies. And then came the Industrial Revolution and put an end to the Malthusian era of humanity! However, not in the way you think it did – which, in fact, makes the next part the most controversial of the book. Namely, in Clark’s opinion, the Industrial Revolution facilitated the dying out of the poor, functioning as some sort of an advanced natural selection tool. Look at today’s Malawi or Tanzania for evidence: due to the Industrial Revolution, their people are way poorer than their Stone-Age ancestors. However, in Britain, as the poor got poorer and started dying more, the rich got richer and took over the positions of the former. And with it, they spread a fairly new type of values – hard work, education, rationality – among the strata of society previously governed by illiteracy and instincts such as violence and impatience. Thus, the British started using the resources more sensibly and finally broke out of the Malthusian Trap. Many countries are, unfortunately, still in it. And, if Clark’s analysis is correct, the policies we use to get them out of it, may be utterly wrong. For example, the people living today in, say, Malawi and Tanzania – on average – have a lower living standard than their very distant ancestors. Just as the Industrial Revolution reduced income inequalities within societies,” notes Clark, “it has increased them between societies, in a process recently labeled the Great Divergence. The gap in incomes between countries is of the order of 50:1. In “An Essay on the Principle of Population” published in 1798, Thomas Robert Malthus first touched upon the subject why, in spite of obvious progress, men, on average, remained as wealthy/poor for millennia. When technological advances increase the supply – i.e., more resources – they also increase the birth rate and diminish the death rate – i.e., more people. Which means, the amount of supplied resources per capita remains unaffected. Simply put, because happiness is a relative category. And because our societies are unequal. 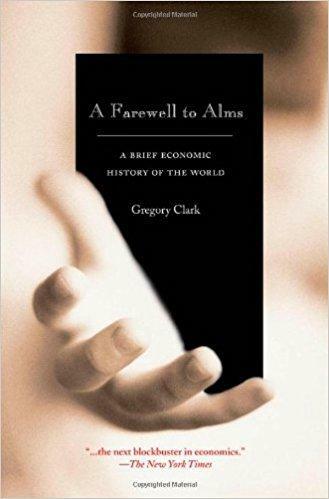 As controversial as an economics book can get nowadays, “A Farewell to Alms” was deemed “the next blockbuster in economics” as soon as it was published. The prediction came true, springing a lively debate of which the main thesis is still a subject. So, the word “stimulating” doesn’t even begin to describe it.